For the second year in a row, we got a several day Brown Drake tease, with just a few bugs on the water each night and each morning. Anglers can expect this action to continue through the weekend. The best hatches and spinner falls will slowly move upstream. By the weekend, the epicenter of the action should be all the way up to the Hwy 20 Bridge. There is plenty of room for everyone out there as long as we all remain kind to one another! Please keep this in mind, especially if this is your first Drake experience. Peace, Love and Drakes is what we celebrate here. Please take this to heart and help your fellow angler whenever you can! During the daylight hours on Silver Creek the fishing has been fantastic. PMD and Baetis are hatching and the Callibaetis action should grow quickly with the heat. The best surface action has probably been on Black Ants. When the wind comes up anglers have been fishing Ants and PMD’s in tandem. This seems to work well, if there are no specific targets to cast at. Moving forward expect to see the Green Drakes on the Nature Conservancy waters with the warmer days. This can be an incredible pattern to fish on the Preserve waters, so be sure not to go to the river without a few! When the Big Wood clears and comes into shape the Green Drake is going to be a great hatch. Be sure to get your fly box full. The Colorado Hair-Wing Drake is among our favorites, as well as the Cripple Patters. The Green Drake Epoxy Back Nymph is also a deadly fly on the Wood and Upper Lost once they clear. Fish this fly underneath a Picabo Royal Stimulator and you’re in business! The Mormon Cricket is showing up on the South Fork of the Boise. If you see them in the water, you can try to imitate them. Some of the fish care for this bug and some could care less. It is a really big, hard bodied bug that takes a big fish to eat it. Warmer days on the South Fork also means the Salmon Flies should be coming. They are generally in the Canyon Section of the river by the second week of June! 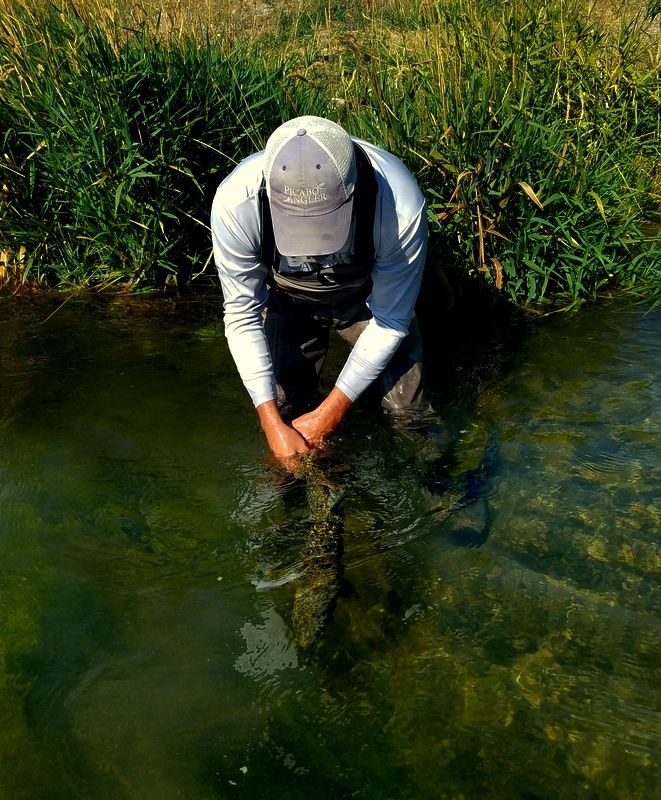 The fishing continues to be strong in the Sun Valley area. 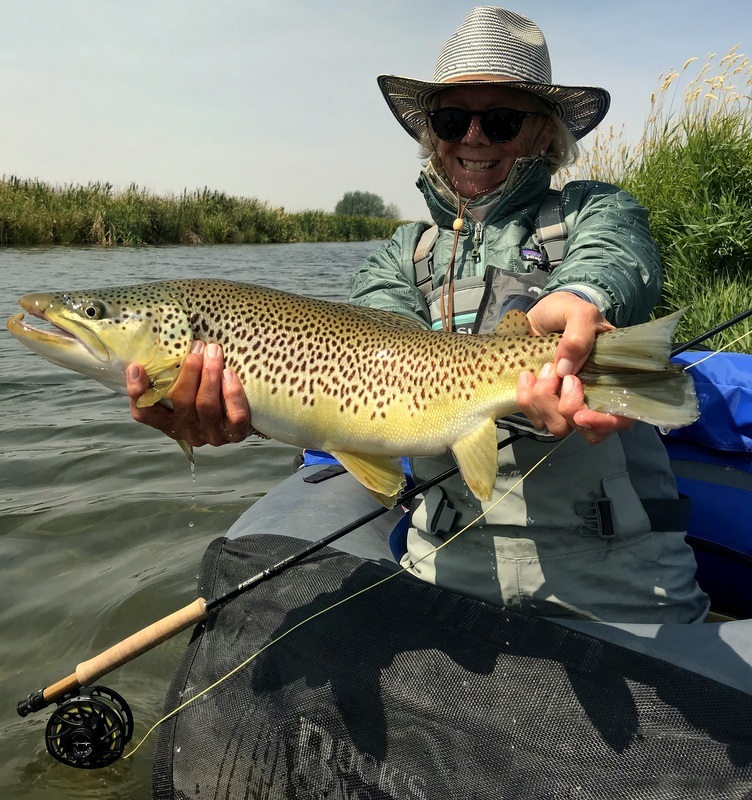 The fishing windows are getting smaller and smaller for Dry Fly anglers, but anglers fishing Streamers and Nymphs can extend their hours on the water. Right now the fishing on the surface is best from about 12:30 to 5:00 p.m. There are some fish that stay on the surface later than that on the right weather day. The Fall Baetis is the dominant hatch right now. The October Caddis is starting to slow and vanish with the freezing nights, and the Mahogany Dun is still out and about, but in fewer numbers than a week ago. Plan on seeing both Mahogany and Baetis Flies on the water into November. We then go into sporadic Baetis hatches up until about Thanksgiving, or whenever Old Man Winter shows up! Most of the Browns are in full spawn mode now, so please be aware and don’t walk over their Redds, or cleaned gravel spots. The Browns that haven’t spawned and especially those fish that are finishing up the spawn will aggressively take Streamers and Mouse Flies! The Big Wood and the Upper Lost continue to fish very well. The Wood is always an amazing fall fishery. Expect Fall Baetis and keep throwing those H and L Variants and Royal Wulffs in the biggest sizes. The Nymphing with Copper Johns and Prince Nymphs is very productive a well. Yes! You can still fish a Hopper and the Hopper / Dropper set up is still effective! Don’t hesitate to try Bee and Wasp patterns as well. The Upper Lost is more a subsurface fishery right now, but anglers willing to walk for it, will catch nice fish on Streamers still. The lower you fish in the system the better right now. The Lower Lost has some Fall Baetis days and the rest of the time Nymphing is the name of the game. Again, the color red is your best bet this time of the season. Red Zebra Midges can be very effective. The South Fork of the Boise still has decent hatches, that start very late in the afternoon. The time of 1:00 p.m. seems to be when the hatches begin. Prior to that, think about hunting Chukar in the cool morning temps. It makes for a great cast and blast day! Finally, like we always say this time of year. Winter is coming and can show up at any time. Please dress and travel with the appropriate gear! Fall is here and the fish and the bugs they eat are all acting accordingly! The fall hatches of Baetis and October Caddis are strong on almost all our area rivers. Flows are very wadable and the fish are up eating off the surface. The Brown Trout are approaching their spawning season and in the meantime they are attacking everything in their path, including our flies!!! Silver Creek is on fire with Fall Baetis and October Caddis. The Mahogany Dun is just getting going, and should really turn on this week! The Baetis action is all day when it is cloudy. If it is clear they tend to come and go throughout the day. The wind does not seem to be a factor, as they are going to hatch this time of the year, regardless of conditions. The October Caddis that grew to magical proportions on the Creek last year, is even bigger and more prominent this season! It is a great way to search the river is nothing else is happening. Try size 14 and 16 Orange Stimulators. The Mouse Fishing for monster Brown Trout is underway and it is working! If you are out during the day and want to catch a big one, get your streamers out and fish hard. The Browns are still moving up river in their prespawn run. The Big Wood, the Big Lost and the South Fork of the Boise Rivers are all experiencing different degrees of Fall Baetis right now. This is such a great hatch and tends to bring all the fish to the surface for one last eating binge before the true winter weather arrives. October Caddis is also in play on these rivers. The Big Wood can be especially good north of Ketchum in the fall. The Lower and Upper Lost can have great hatches, but be sure to check the weather for travel conditions if things start getting stormy again. The Western Red Quill continues to bring fish up throughout the river. Your Green Drake patterns are all you need! The biggest miss this time of the year for most anglers, if giving up on Hopper season too soon. Be sure the fish saw plenty of Hoppers this year and they are still happy to eat them. The first few frosts we have had kills most of them, but they fish don’t know that! It is the time of year to carry supplies in your vehicle. Start bringing extra food, water, clothes, matches, and a sleeping bag. This is not the time of the year to get caught stuck overnight on a river without supplies! 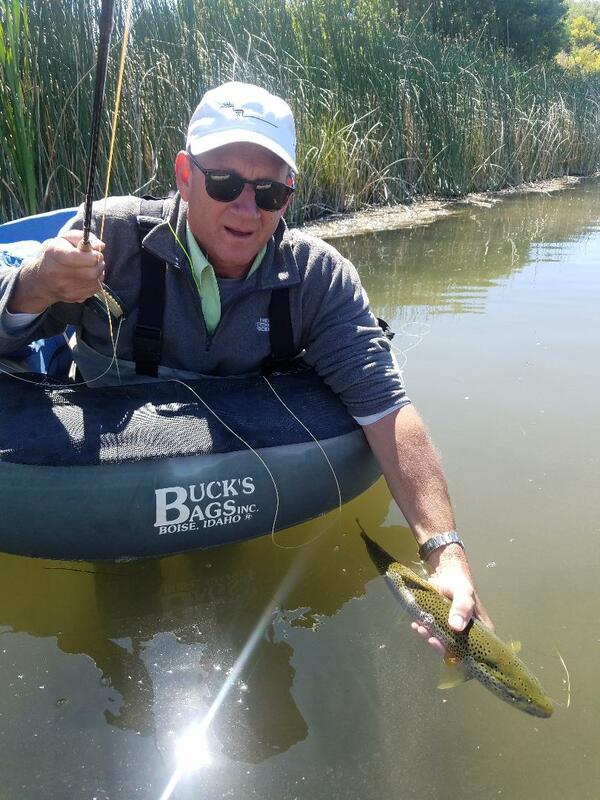 Big Brown Trout Expert Max Blume always shows up when the Mouse Fishing is HOT! A slow cool down is headed to the Mountains. With this we should expect to see the first big changes from our summer fishery to our fall fishery. In the meantime all the same bugs and techniques we’ve used over the past few weeks are still in play this week! Silver Creek is beginning to see more and more Baetis activity. A sure sign fall is coming. The Trico Spinner Falls begin to wane as the Baetis cranks up. Expect to see a few Callibaetis Spinners mixed into the morning show as well. The afternoon activity continues to percolate with Callibaetis activity. Expect this to remain strong as long as the heat continues. The Hopper action on the Creek remains outstanding and the fish are also still looking for Damsel Flies. The evenings on the Creek are a smorgasbord of bugs, and we are quickly approaching the best Mouse fishing time of the season. The Big Wood continues to impress as the fishing remains excellent. Parachute Adams in a variety of sizes is a great choice as well as Hopper patterns. A Dave’s Hopper on the Big Wood is a deadly fly this time of year. It is also time to start putting the Western Red Quill in your fly box and a few October Caddis also. The Upper Lost is also impressive with fish being caught throughout the system. It doesn’t seem to matter where you fish. Flying Ants, Royal Trudes, Parachute Adams and Hoppers are all good choices. Anglers may see a few Trico takes in the morning as well. It’s just a matter of finding flat enough water for a big fish to eat them! The Lower Lost has been slightly underwhelming as the Hopper bite continues. The Nymphing has been o.k. with Copper Johns and small Tungsten patterns. 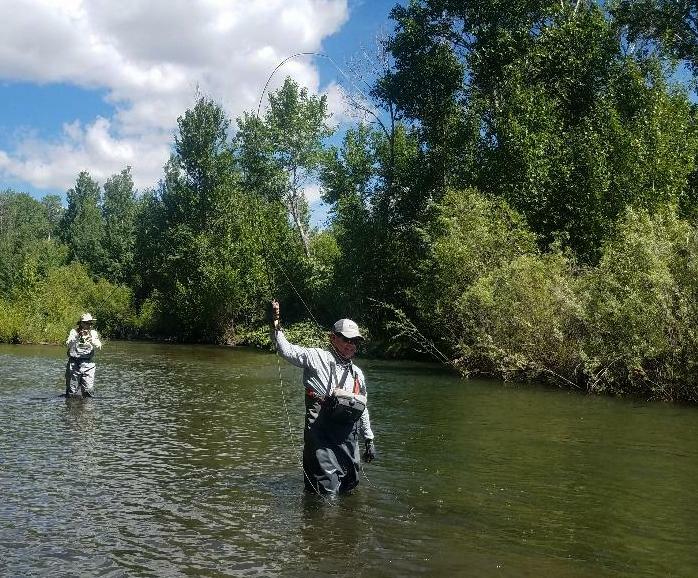 The Crane Fly action is still happening, and skating flies remains one of the most fun ways to fish the river! The South Fork of the Boise remains stuck between optimum wading flows and optimum boating flows. Smaller boats will have an easier time on the river and the wade fishing anglers will find things slightly more manageable. Hopper, Flying Ants, Pink Alberts and be sure to have October Caddis in case this bug shows early this year! It’s a good time to fill your fly box for fall. Upcoming hatches include Fall Baetis, Mahogany Duns, Western Red Quill and October Caddis. Our late summer heat wave continues and with it means all the same late summer bugs. The rivers continue to drop and as they do the fish are filling in the voids left by the falling water. Areas that looked fishy a week ago, but had not fish are going to start filling with fish as the flows decrease and allow more dispersal. Expect a lot of fish movement in the coming weeks on all our area waters. Silver Creek is just a gem in the afternoon right now. The Callibaetis show when the wind is down is incredible. The action starts after lunch and peaks before dinner. The Hopper action remains strong, although the fish are getting wiser and not eating as aggressively. Be sure you let the fish take the fly well, and then set the hook hard. Try to fish across the current as much as you can to get the best hook setting angle. Facing downstream and casting can be effective, but you inevitably will be pulling the fly upstream out of the fish’s mouth. The morning on the river is decent with Trico Spinners, Baetis and some Callibaetis. Expect more of the same great action in the coming weeks! The Big Wood and the Upper Lost Rivers continue to change as flows abate. The fishing is fabulous on both rivers. Hoppers are peaking, and small attractors are taking fish. Parachute Adams and Royal Trudes are hot flies, as well as Flying Ants. Trico action is a possibility in a few areas where the water is flat enough, although the high water has taken most of the Trico action away. The Lower Lost River is fishing pretty well with Crane Flies, Hoppers and Nymphs. Small Zebra Midges in Red and Black are a good choice as well as Copper Johns in Red and Copper. Fishing these two patterns in tandem can be very effective under a strike indicator. The South Fork of the Boise has been dropped to nearly wadable flows, but just not quite. Small boats can still make the float and a bit more wading action is available, but do it with caution. Expect to see a few Pink Alberts and a large amount of Hoppers. Some Nymphing around the boulders and in the riffles can be effective. Small Pheasant Tails and Copper Johns are a good choice as well as a Red Squirrel Nymph.